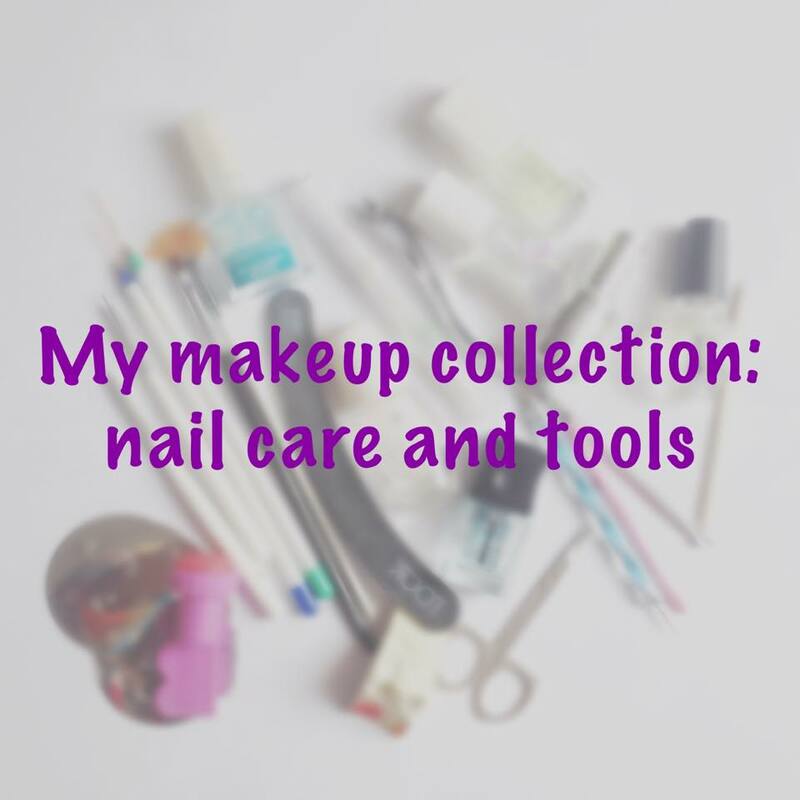 This is something I use every once in a while, when I feel my nails need a little pick me up. This is a very liquidy product, which you’re supposed to brush onto your nails like you would nail polish and wait for it to absorb. It does have quite a strong fragrance, but it works quite nicely. I’ve had it for ages, so I have no idea where I got it or how much I paid for it. This I’ve had for quite some time as well (most of these are quite old actually, but still work). It’s a lot thicker than the previous one and has little white dots inside. I like to brush it on my nails, wait a couple minutes and then rub it in my nails and wait until it’s fully absorbed. I use this when my nails are really weak and have a hard time growing. It was around $3. This is almost empty, but I did enjoy using this, so I wanted to share it with you. This is one of those products that you reapply each day for 3 (or seven, I can’t remember) days and then take it off. At the time when I was struggling with really lame nails, this stuff helped a lot. It really did make my nails harder. I probabbly would repurchase if I had as lame nails, but they are better now 😀 It was somewhere between $10 and $15. To be honest, my cuticles can get a little crazy, so I need something to soften them so I can push them back. Any oil works just fine (coconut, almond, olive), but I do have a couple that are store-bought. This has tiny blue dots, but I’m not sure what they do, haha. I don’t even remember purchasing this, so I really can’t tell you how much it was. I got this from eBay. 10 of these were somewhere around $9 and they’re supposed to be different scents, but they actually smell the same to me. They are obviously not real OPI, they even have a typpo on the packaging, but it works nicely, so I don’t really care. The one I have here is Aloe Vera. This product, as well as the next one, is actually supposed to be in the first group of products, but I actually don’t use them for what they’re supposed to be used, but I use them as base coats. This one is for whitening nails, which is actually quite cool, because while you’re wearing dark colors, it’s not only preventing your nails from turning yellow, but also making them whiter! How cool is that? This was around $3. Same as the previous one- it’s not really a base coat, but I use it on days when my nails are more fragile instead of the previous one, so it’s both making my nails stronger and preventing them from turning yellow. 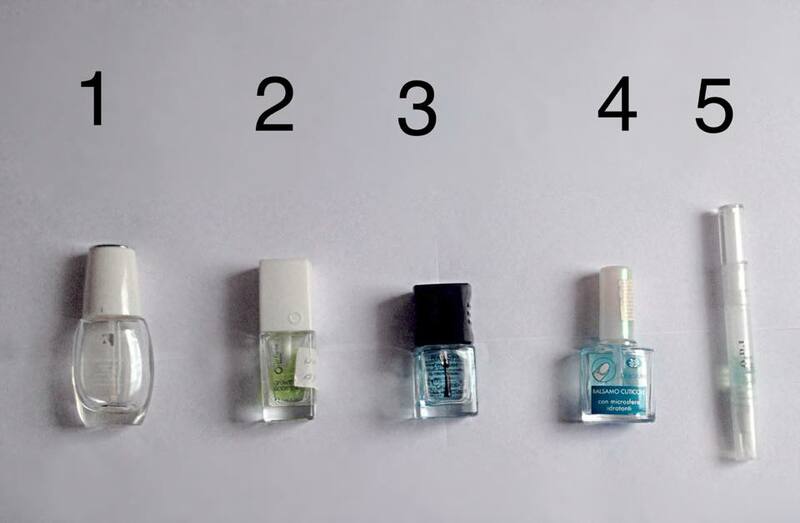 I do have more than one top coats, but others are just clear nail polishes, that I use as top coats, so I don’t think that really counts. This is the only proper one, and it’s not very thick, which I really love because I feel that it seals the design much better. So I guess it works, haha! I got that as a gift in a set, so I’m not sure how much it costs, but I feel like you shouldn’t have trouble finding Konad products even in Croatia. I’ve had this for a while now, too and I like to use it when I don’t really feel inspired or don’t feel like drawing, or don’t have a lot of time but need a nice nail design. I could show you how to use it in a future post. 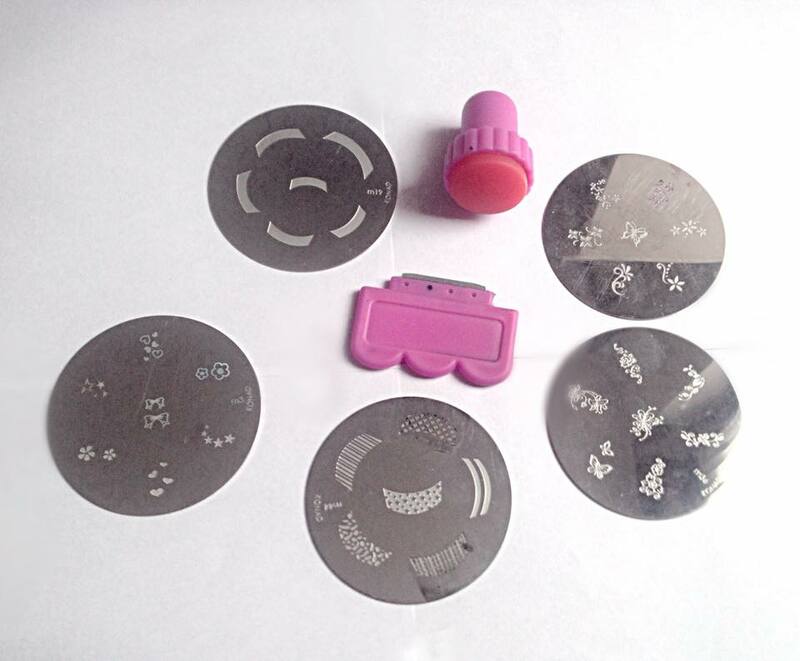 But it consists of a stamper, a scraper and design plates (I also got some colors and a top coat). Plates that I own (and I’m sure I have more somewhere, but I couldn’t find them) are m36, m3, m19, m44 and the one I got in a similar kit by Essence, but it doesn’t have a name. I think it’s really quick and easy to use and I recommend it to anyone who doesn’t like drawing on their nails but want cool nail art. I got this from eBay. There were two of these in a package and they were around $1.5. Quite cool, right? So one side is for pushing, and the other is for cutting and removing excess. 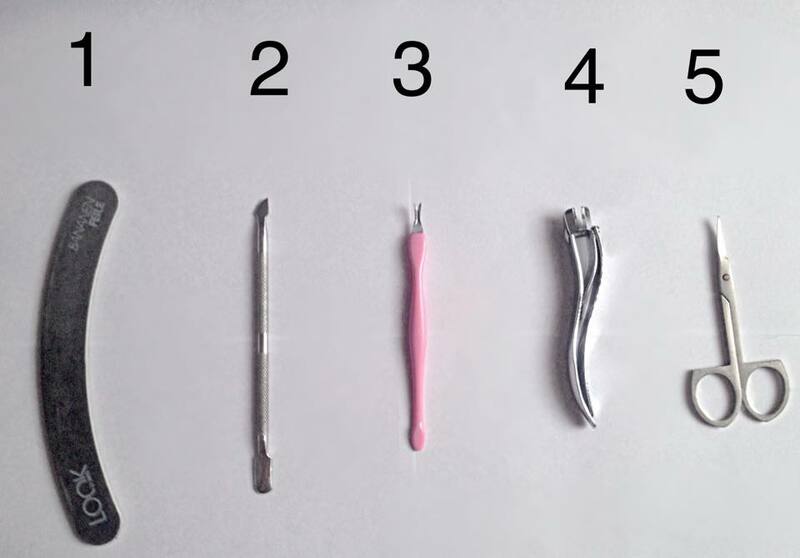 I do use it very often and yes, I know it’s not healthy to cut cuticles (same goes for the next product I’m going to mention), but they get really ugly, and I have no other choice. Maybe you know how to prevent it? I got this from eBay as well and I got a bunch for really cheap. I use this after pushing my cuticles if I have some weird bits that need to be cut off. This is pretty much self-explanatory. I use this to cut my nails (it’s healthier than using scissors) and especially if I don’t want a rounded shape, but a more rectangular shape for my nails. I like this one because it’s quite big, so I can clip off the entire nail at once. This little guy is very convenient when placing rhinestones onto your nail, but you can use it for many different things like pushing cuticle, repairing your design, a dotting tool, you name it! It’s cheap and it usually comes in sets of more than one, haha (sorry I don’t know what the rule of thumb for orange stick is). Now for the real thing- a dotting tool. 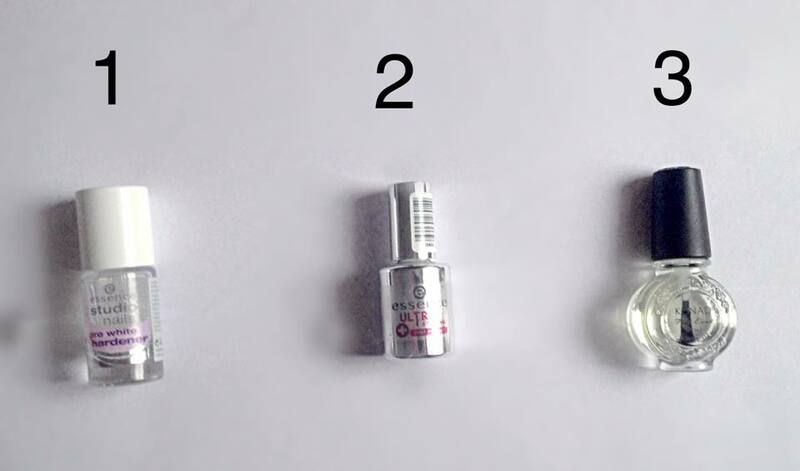 It really has only one function- dotting, or placing dots on your nails, but it can be used for placing rhinestones as well. There are various sizes of these, and I have a two-ended one that has a bigger and a smaller side so I can do whatever I want with it. I have a lot of these, and use most of them, but here I have 4 to show you, because they are kind of different. 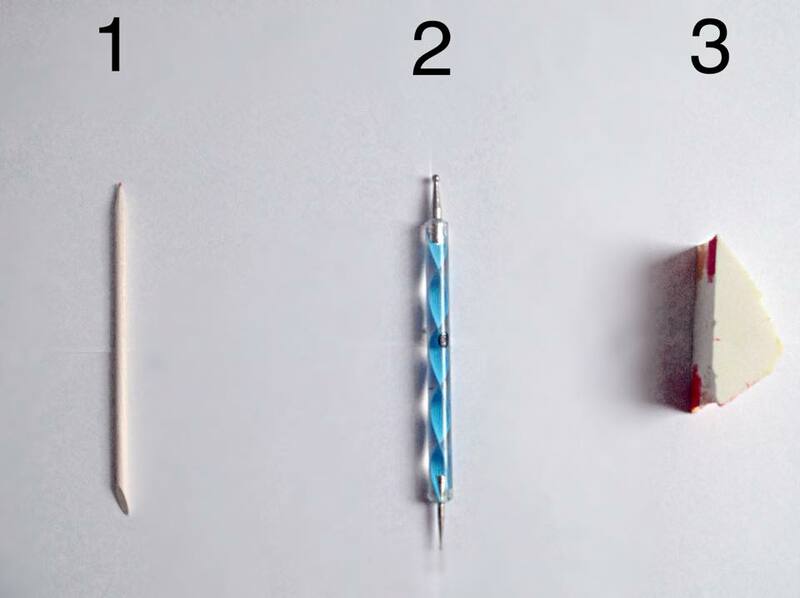 The first and the second one on the picture are the same, but the first one I made thinner by cutting some of the bristles off. 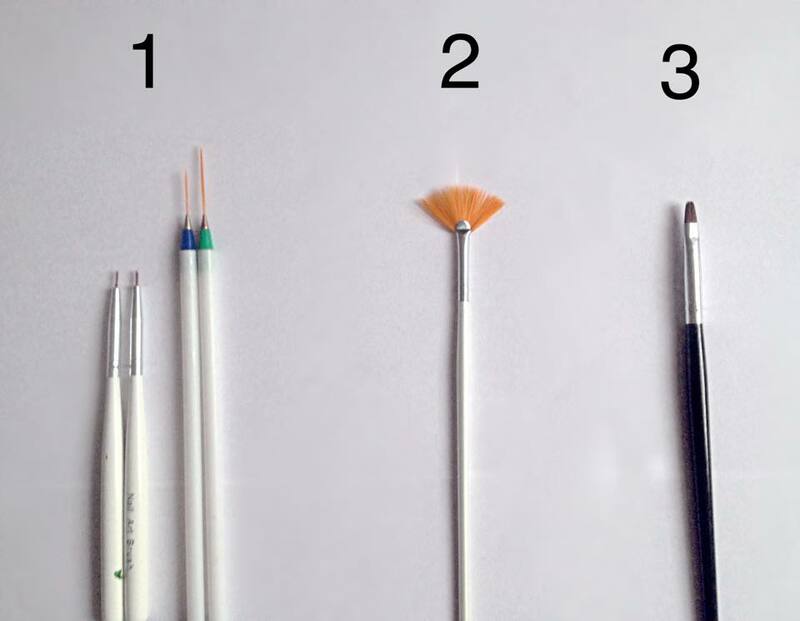 The third and the fourth are with longer bristles, which are great for making straight lines, but if you have a really steady hand, you can use it for drawing as well 🙂 I bought these in sets from eBay and they were $0.99 for a set of 3 (for the long bristle ones) or $1.99 for a set of three (for the tiny ones). This brush can be used for a few things. First is when you are doing glitter nails, you can use this brush to wipe off the excess glitter after dipping your nail in glitter powder. The second is for doing nail art by dipping the brush in color and creating different colored lines on your nails like the first manicure in this post. I use this brush for creating custom nail colors. I mix them on a piece of paper and then use this brush to apply the color on my nails. It’s very soft and easy to use, so I love it! Make sure you always clean your brushes after using them with acetone, or else they will turn very stiff and impossible to use. What do you have in your collection? What would you add to mine? Which collection would you like to see next?